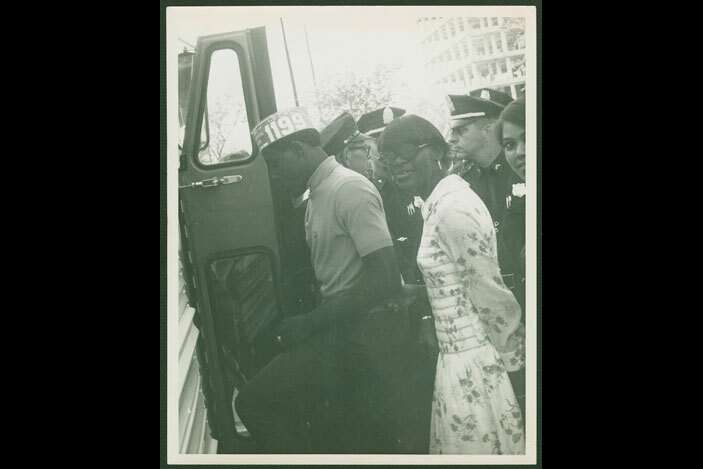 • Noon to 2 p.m.
Lecture, discussion and book signing featuring Dorothy Cotton, SCLC education director from 1960-1968 and former vice president for field operations at the Martin Luther King Jr. Center for Nonviolent Social Change in Atlanta. Her new book, "If Your Back's Not Bent: The Role of the Citizenship Education Program in the Civil Rights Movement," will be available for sale and signing. Opening celebration for exhibition. Speakers will include current SCLC leader Charles Steele Jr.; SCLC board president Bernard Lafayette; and Dorothy Cotton, SCLC education director 1960-1968. Fishburne deck parking and walking directions. 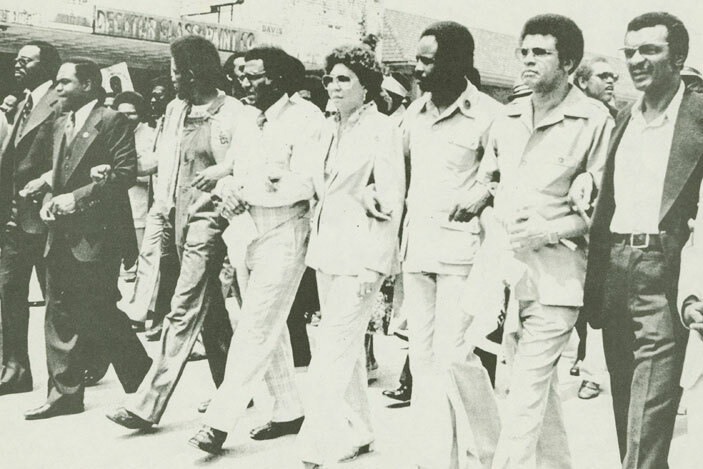 An exhibition featuring materials from the Southern Christian Leadership Conference (SCLC) archive will open Thursday, Feb. 21 at Emory University's Robert W. Woodruff Library. An opening celebration on Friday, Feb. 22 from 6-8 p.m. will feature remarks by SCLC leaders Charles Steele Jr. and Bernard Lafayette (board president); and Dorothy Cotton (SCLC education director 1960-1968). 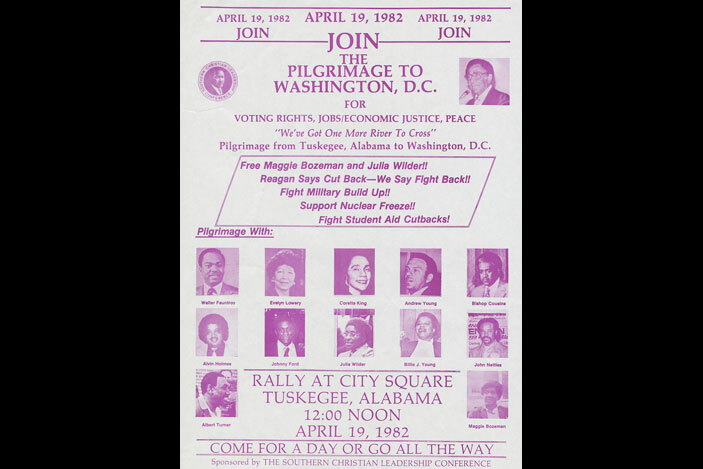 Titled "And the Struggle Continues: The Southern Christian Leadership Conference's Fight for Social Change," the display documents the Atlanta-based civil rights organization's history, progress and continual work for equal rights. Emory's Manuscript, Archives, and Rare Book Library (MARBL) holds the SCLC archive. The exhibition, which runs through Dec. 1, is in the library's Schatten Gallery and the Jones Room, both located on the third floor of the Woodruff Library. The exhibition and celebration are open to the public free of charge. "With this exhibition and related events, we feel so honored to have this opportunity to recognize the historic contributions of SCLC and all those associated with it, past and present," says Rosemary Magee, director of MARBL. "They represent the hope and the drive to seek equality in all aspects of life. The library is a perfect place to honor these shared aspirations for all people." The SCLC exhibition focuses on the ongoing struggle for civil and human rights in the years after Martin Luther King Jr. was assassinated in 1968. Curators are Carol Anderson, associate professor of African American studies and human rights historian; Sarah Quigley, manuscript archivist and former SCLC project archivist; and Michael Ra-Shon Hall, a doctoral candidate in Emory's Institute for the Liberal Arts. The exhibition highlights the SCLC's major programs from the 1970s through the 1990s, beginning with the Poor People's Campaign in 1968. 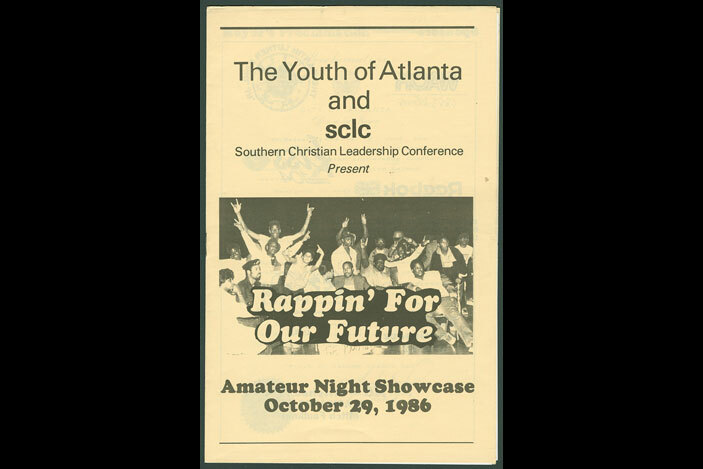 Other initiatives include SCLC's efforts to combat apartheid in South Africa; programs in the 1990s designed to engage youth, such as Rappin' for our Future (an amateur talent showcase focused on promoting a nonviolent lifestyle); and initiatives focused on healthcare and economic equality, ending gun violence and other issues. "One of our major points in the exhibition is that a lot of the issues they were talking about—universal access to healthcare, gun laws, voting rights—anticipated many of the issues that have been at the forefront of our national conversation recently," Quigley says. She adds that the curators hope the exhibition will prompt visitors to think about "what has and has not been accomplished, and what work still needs to be done. We hope to dispel the notion that the struggle for civil and human rights ended in 1968." Four sections comprise the exhibition: Economic Justice; Global Human Rights; Health of the Mind, Body and Spirit; and the Legacy of the SCLC. "The papers reveal the extent of organizing people and communities around issues of healthcare, criminal justice, education, voters' rights, fair employment—those are things we understand to be essential to quality of life, regardless of who you are," Anderson says. The documents on display include letters, photographs and flyers promoting gatherings and protests. Among the most compelling photos are those of Resurrection City during the Poor People's Campaign of 1968, when thousands descended on the nation's capital to demonstrate for equal opportunity for the impoverished. 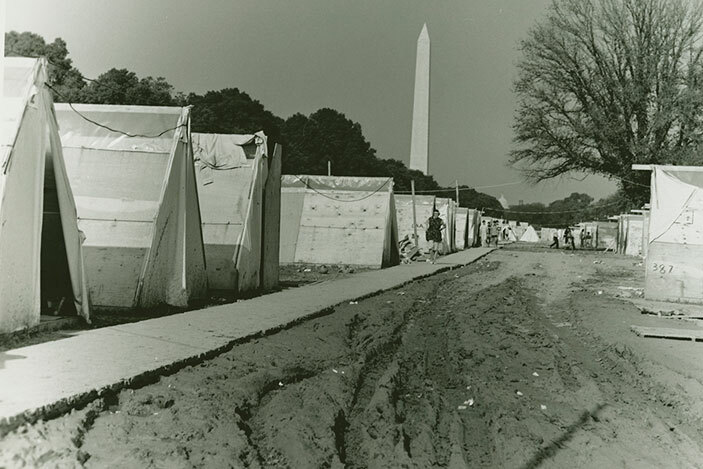 Protesters lived in plywood shacks and A-frame tents on the National Mall in Washington, D.C., for a month in May and June 1968 to demonstrate their plight to a national audience, until the government ordered police to drive them out. Artifacts on display include street signs (with names such as "Justice Parkway" and "Voter Rights Ave.") that were posted in Resurrection City, as well as buttons and hats worn by protesters during the Charleston hospital workers' strike of 1969. "One of the things I like is that it's a very visual exhibition—visuals have played a consistent role in the struggle for equality," Anderson says. "You see the marches, you see the poverty in Resurrection City, you see the meetings with key leaders as they're trying to create a much more peaceful world." The exhibition also conveys that SCLC is still active. For example, the organization moved its annual convention last August to Sanford, Fla., to rally in support of the Trayvon Martin case, and it voiced concern about voting issues in Florida in the 2000 election. "SCLC is still an active organization. It never closed its doors," Quigley says. "It continues to raise awareness. They're still holding demonstrations; they're still talking about nonviolence." SCLC placed its archive with MARBL in 2008. Archivists worked on the materials for three years, and the papers opened to the public in May 2012.